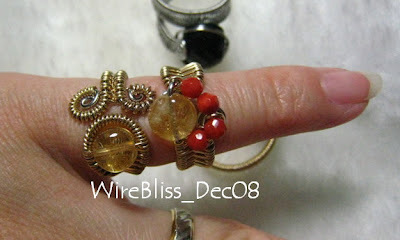 The three gold filled wire woven rings are made for a good friend of mine and her mom - GK. Her birthday is coming very soon and I hope that these rings for her two little fingers will bring her all the "ong" (good fortune/luck) she needs :) I use Citrine for both rings as Citrine attracts wealth and people who can prosper us. For the other gold filled ring, I use Obsidian and this is a gift for GK's mom. They say Obsidian helps to promote grounding and release tension and energy blockages. 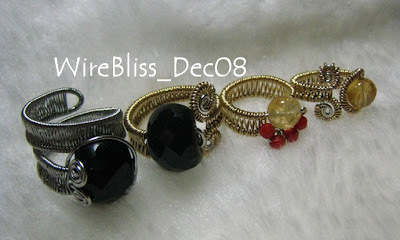 The last ring, black onyx woven ring (stainless steel wire) is a commissioned piece. Those are really REALLY wonderful. I am so in awe of the work you do. Thanks for visiting and reading Alena. I try to post as often but for now its normally when I finished new pieces. Feel free to leave comments. I appreciate them :) At least I don't feel like I am talking to myself.